Questions come up frequently about how come the cabinet pulls don’t show or how to show more than one pull type in a room. 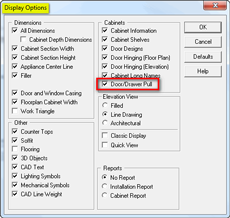 This tech tip is a reminder of how the cabinet pull/handle feature works. 1). 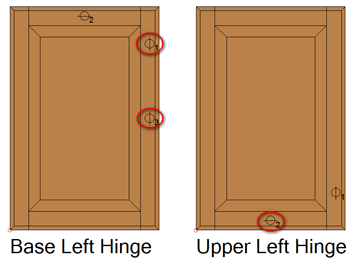 Have a pull locator on the door or drawer front graphic. 2). Choose a pull/handle from View-Pick User Graphics. 3). Turn on the display option to show the pulls. 4). 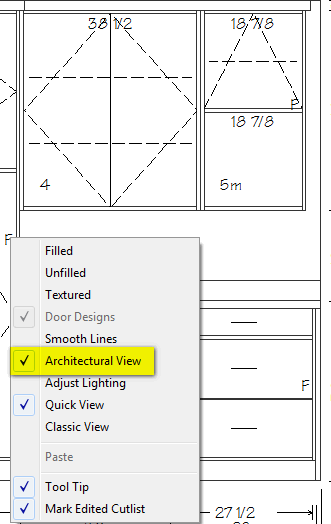 Use a display other than Architectural. 1). Linking a 3D Object to the Hardware. 2) Using alternate pull locations. 3). Modifying the hardware factors on a section basis. We’ll go over these in order. Start with putting the pull locators on the door / drawer front graphics. 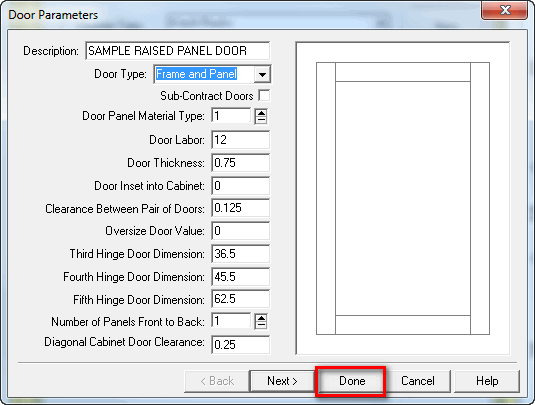 With the Manufacturing versions, go to File Setup Parameters and select a Door or Drawer Front file to Edit. Click Done when in the Edit mode. 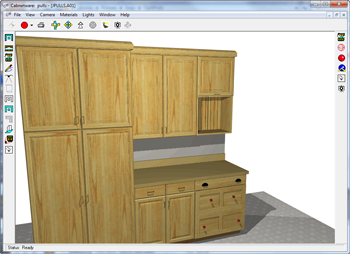 Then select CAD Enhancements. Choose a Vertical or Horizontal pull location. 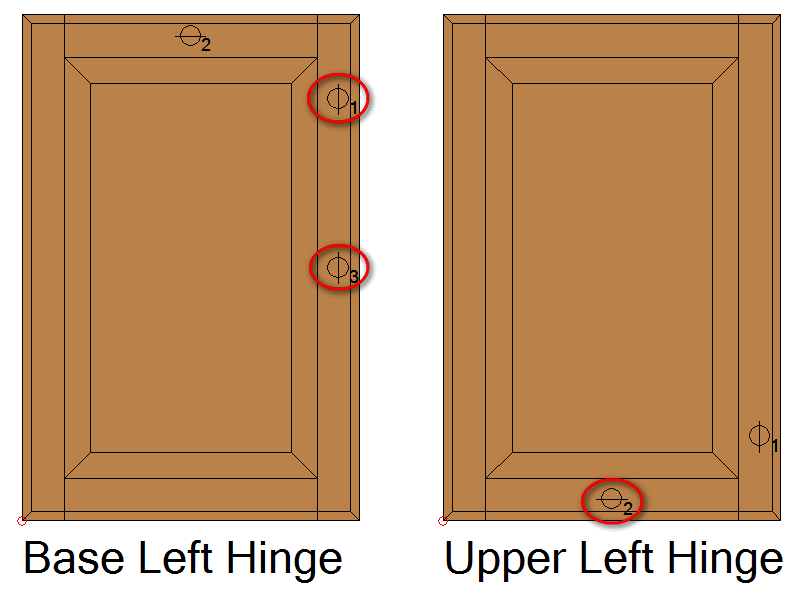 Put the symbol on the door/drawer front relative to the edge. (It can be moved and changed later). This will be the center line of the pull to be chosen in the room design. 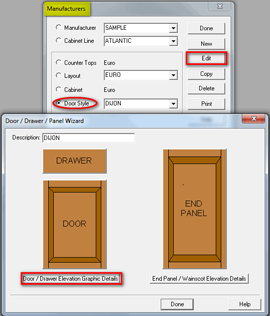 If you are using the Design program, get to the Door/Drawer graphics by going to File Setup Manufacturers and select a Door Style and then Edit. 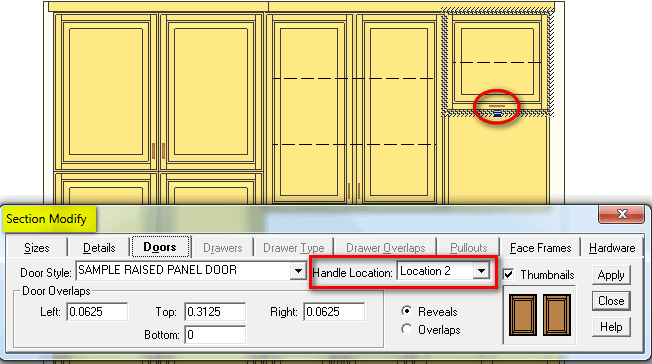 Click the Door/Drawer Elevation Graphic Detail button. You can put numerous pull locators on and designate them to be vertical or horizontal. 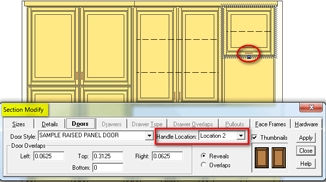 The Locator Handle ID number will allow you switch locations of the pull easily via section modify. If you put two of the same ID number locators on, you will end up with two pulls. This may be useful for a wide drawer front. 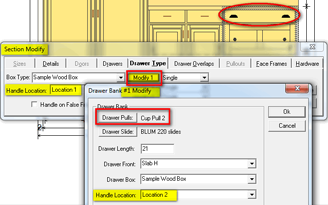 Do this if you use the Design program or don’t have a hardware link to the 3D Object pull graphic. In the room use View – Pick User Graphics and select from the available pulls. 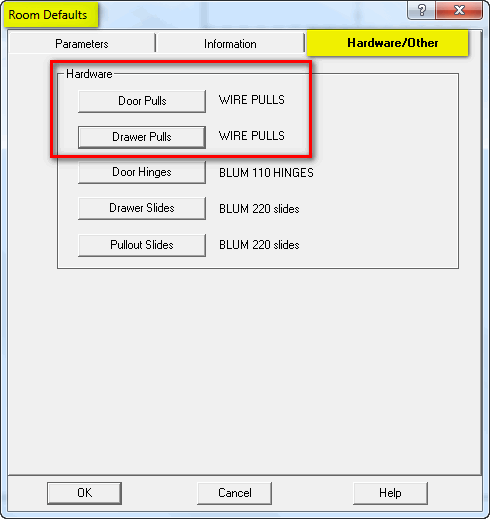 In the room, turn on the Door/Drawer Pull option by going to View – Display Options. This can be set as a default in Preferences too. 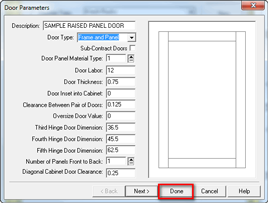 Architectural view shows a generic pull maker and door hinge swing indicator. Not a pull. With the Manufacturing version you can associate a 3D graphic with the Hardware selected for the pull. Do this in File Setup Hardware. Edit a pull and select a graphic to use. 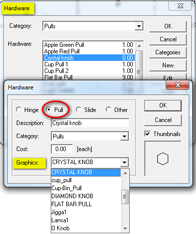 The list of graphics will include everything you have available for Pulls/Handles in Setup User Graphics. This list can be enhanced by using the Import feature to add more objects. The Design version has no hardware to link the graphic to, but it will list all the pulls that have been added via Import. 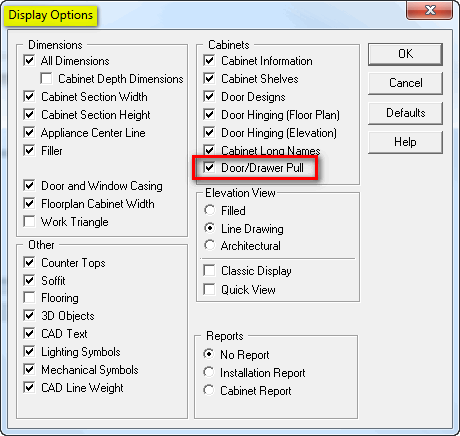 Now, when you select the hardware for the room, the pull graphic is automatically assigned. You can also change the hardware on the section basis in Section Modify. 2). Using alternate pull locations. 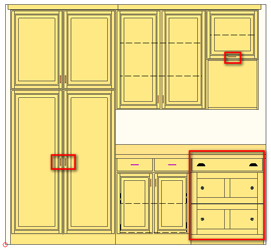 Select an alternate pull location in Section Modify to select for a top hinged door pull or two pulls on a drawer front for instance. 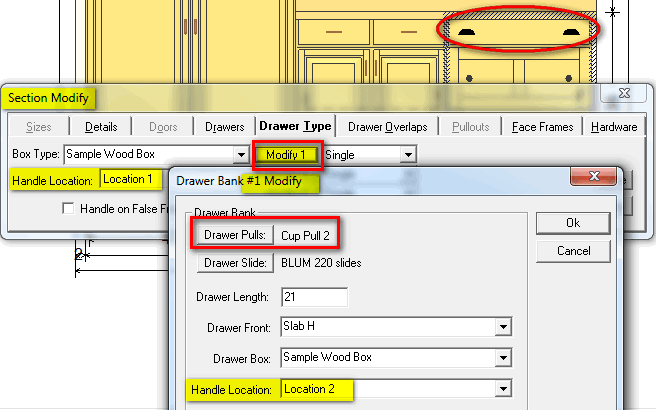 You can also select a different pull location for each drawer in a drawer stack at this level of Section Modify. You can select a different hardware pull here too. 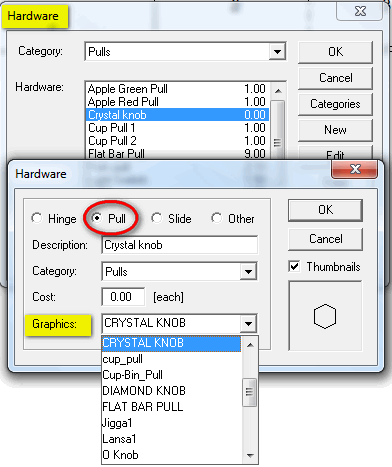 If you have Cabnetware Ultimate, you can even re-position, or delete the individual pulls in Multi Cross Section. Earlier versions of Cabnetware prior to 2011 R1 work similarly. 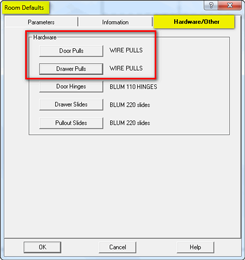 Some exceptions are: The Pull/Handle display option isn’t there; there is no 3D Object graphic link to the hardware, and hardware locations could not be adjusted in Multi Cross Section.